・　I am a scientist, so my first response after the accident was to head to Japan, collect samples and assess the situation. Near the reactors, where we were not allowed to sample, levels of radioactivity in the ocean spiked to more than 10 million times the pre-accident background in early April. 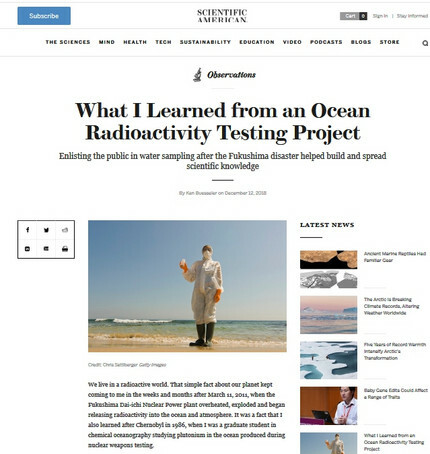 ・The result was Our Radioactive Ocean (ORO), a crowd-funded campaign to measure the levels of radioactive cesium along the West Coast of North America and around Hawaii. Our goal was to empower individuals and groups to collect water at their favorite beach with our simple kit, then send the sample to my lab for analysis. In the process, they would take ownership of the information we returned to them and hopefully become ambassadors for the scientific process and the knowledge that we assembled, one sample at a time.